He was my eight year-old son and we were on our first road trip together, an odyssey to watch the Detroit Tigers play a game in old Tiger Stadium. The Tigers were in the midst of playing their final season in the glorious old park on the corner of Michigan and Trumbull. This wonderful concrete, steel, wooden, and lush green old lady began her life in 1912 as a twin to Fenway Park in Boston. They both began life on April 20. I love old baseball stadiums. I took my wife on a trek to Cleveland Memorial Stadium to watch the final opening day. We were dressed like we were scaling the Matterhorn. Alas, it wasn’t enough. The breezy, 45 degree day chased us in the seventh inning. I felt like I had just given up a three-run double and watching the aged manager emerge from the dugout as my wife looked over at me through misty blue eyes and asked me for the keys. (Now before I go any further, I want to be perfectly clear. I am not, in any way, comparing my wife to Tommy Lasorda). I had kept her there too long. Her eyes were misty, but not because of sadness at the thought of leaving the game early. She had just endured another “I can’t believe you’re still here” blast of arctic wind slapping her in the face. On another occasion, my brother and I ventured to the south side of Chicago to watch a game in old Comiskey Park in her last summer. We could see what was to be the new US Cellular Field being constructed just above the first base-line grandstand. It reminded me of the rich old man parading his young paramour in front of his aging wife. My wife was reluctant to let me take our only son to Detroit. She was afraid he wasn’t mature enough to look out for me. After I pried him loose from her unusually strong clutches, we were off. He still had hug indentations on his body and they didn’t disappear until we crossed the Ohio River. I decided to stop in Moraine, Ohio to call my former college roommate. This was where I made that fatal mistake. You see, this was before I recognized how incomplete my life was without a cell phone. I stopped at a convenient store where I spied a pay phone. My decision-making was flawless… until I saw there was no phone book. At this point, my wife’s intuitive feelings began to materialize. Like Nostradamus on the cover of The Star, her predictions began to unfold. As I was coming out after looking up the phone number, I met him coming in. Of course he did not turn off the engine and put the keys in his pocket, but he did manage to lock the door. My wife was right. He was not old enough to clean up my poor decisions. He couldn’t even think to call the police. 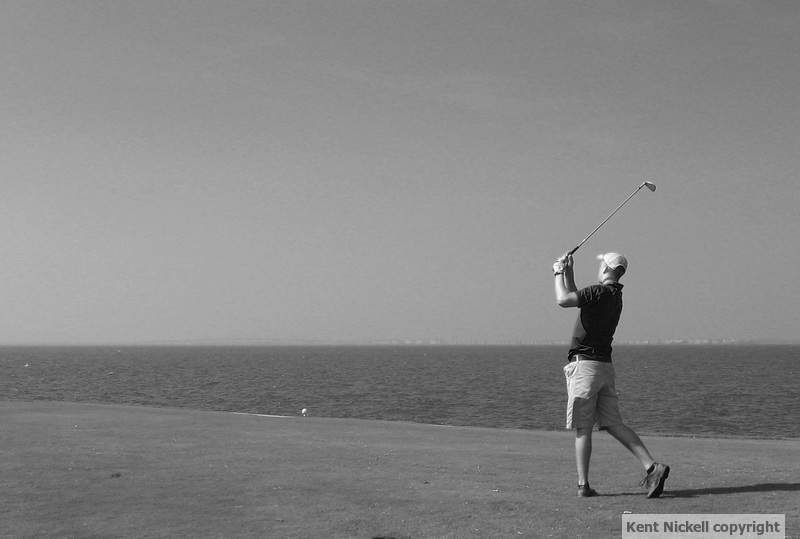 I took this picture of my son two years ago while playing golf in Nags Head, NC. This is a beautiful golf hole bordering the sound. I have had many memorable days with my son, a lot of them involve a golf course or a baseball stadium. I have been thinking a lot about days we have spent together lately, for next month, he is getting married. His fiancee is a wonderful young woman. He has chosen wisely. He will have an entertaining life with her. I just hope she likes going to baseball games and playing golf with me and my son. My wife says she is mature enough to take care of us.